You don't need to be an expert to create home movies that play on the TV. Just drag-and-drop your videos on the storyboard panel and burn the disc! DVD Author Plus writes DVD Video discs that are compatible with most standard DVD player and also play on any Windows PC. 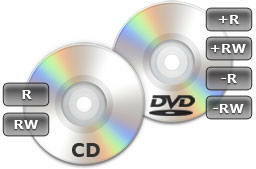 Once the finished disc is inserted into a player, the video starts instantly, without the need to click through a DVD menu. Preserve your existing discs by creating ISO image files of any DVD or CD. It's the perfect way to back up your CD and DVD library to your PC. You can always replace a lost or damaged disc by burning the image file back to a blank CD or DVD disc. DVD Author Plus also shows you which disc types are supported by your drive (RW, +R/-R, Dual Layer, etc.). I tried about twenty other products and DVD Author Plus created a better looking DVD video than all of them.